For other uses, see Landline (disambiguation). "Fixed line" redirects here. For the mountaineering technique, see fixed rope. A landline telephone (also known as land line, land-line, main line, home phone, landline, fixed-line, and wireline) is a phone that uses a metal wire or optical fiber telephone line for transmission as distinguished from a mobile cellular line, which uses radio waves for transmission. In 2003, the CIA World Factbook reported approximately 1.263 billion main telephone lines worldwide. China had more than any other country at 350 million and the United States was second with 268 million. The United Kingdom had 23.7 million residential fixed home phones. The 2013 statistics show that the total number of fixed-telephone subscribers in the world was about 1.16 billion. The number of landline subscribers continuously decreases due to upgrades in digital technology and the conveniences that come with switching to wireless (cellular) or Internet-based alternatives. A fixed phone line (a line that is not a mobile phone line) can be hard-wired or cordless and typically refers to the operation of wireless devices or systems in fixed locations such as homes. Fixed wireless devices usually derive their electrical power from the utility mains electricity, unlike mobile wireless or portable wireless, which tend to be battery-powered. Although mobile and portable systems can be used in fixed locations, efficiency and bandwidth are compromised compared with fixed systems. Mobile or portable, battery-powered wireless systems can be used as emergency backups for fixed systems in case of a power blackout or natural disaster. The term landline is also used to describe a connection between two or more points that consists of a dedicated physical cable, as opposed to an always-available private link that is actually implemented as a circuit in a wired switched system (usually the public switched telephone network). So-called leased lines are invariably of the latter type; the implications of a land line in this context are security and survivability. For example, a military headquarters might be linked to front-line units "by landline" to ensure that communication remains possible even if the conventional telephone network is damaged or destroyed. Another example of this is in airports. All air traffic control towers have dedicated lines connected to the police, fire department, hospitals, army, etc. Deployed as a precaution in case of emergency, these can be used at any time. In many countries the landline has not been readily available to most people. 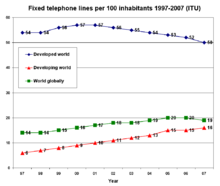 In some countries in Africa, the rise in cell phones has outpaced any rise in landline telephones. Between 1998 and 2008, Africa added only 2.4 million landlines. During this same time the number of mobile phone lines that have been subscribed to has skyrocketed. Between 2000 and 2008, cell phone use has risen from fewer than 2 in 100 people to 33 out of 100. It is more difficult to install landline copper wires to every user, than it is to install mobile wireless towers that people can connect to from anywhere. There has also been substantial decline of landline phones in Indian subcontinent, in urban and even more in rural areas. In the early 21st century, the landline telephone has declined due to the advancement of mobile network technology and the obsolescence of the old copper wire networking. Eventually these metallic networks will be deemed completely out of date and replaced by more efficient broadband and fiber optic landline connections extending to rural areas and places where telecommunication was much more sparse. Some see this happening as soon as the year 2025. In 2004, only about 45% of people in the United States between the ages of 12 and 17 owned cell phones. At that time, they had to rely on landline telephones. In just 4 years' time, that percentage climbed to about 71%. That same year, 2008, about 77% of adults owned a mobile phone. In the year 2013, 91% of adults in the United States owned a mobile phone. Almost 60% of those with a mobile had a smartphone. A National Health Interview Survey of 19,956 households by the Centers for Disease Control and Prevention released May 4, 2017 showed only 45.9 percent of U.S. households still had landlines, while 50.8 percent had only cell phones. Over 39 percent had both. In Canada, more than one in five of households use cell phones as their only source for telephone service. In 2013, statistics showed that 21% of households claimed to only use cellular phones. Households that are owned by members under the age of 35 have a considerably higher percentage of exclusive cell phone use. In 2013, 60% of young household owners claimed to only use cell phones. Many of the consumer protections which regulators apply to incumbent landline providers, such as restrictions against cutting off subscribers without notice, do not apply to competing communication services such as cable modems and voice over IP. Look up landline in Wiktionary, the free dictionary. ^ "The World Factbook:REFERENCES :: DEFINITIONS AND NOTES". www.cia.gov. Retrieved 11 November 2018. ^ "UK households: ownership of landline telephones 1970-2017 | Survey". Statista. Retrieved 11 November 2018. ^ a b Aker, Jenny C; Mbiti, Isaac M (August 2010). "Mobile Phones and Economic Development in Africa" (pdf). Journal of Economic Perspectives. 24 (3): 207–209. doi:10.1257/jep.24.3.207. Retrieved 11 November 2018. ^ "The decline of the landline: Unwired – The Economist". The Economist. Archived from the original on 2013-11-08. ^ Amanda, Lenhart. "Teens and Mobile Phones Over the Past Five Years: Pew Internet Looks Back" (PDF). www.pewinternet.org. ^ "Mobile Technology Fact Sheet". Pew Research Center's Internet & American Life Project. 27 December 2013. ^ "Milestone for cellphones vs. landline phones". CBS News. 4 May 2017. Archived from the original on 16 June 2017. Retrieved 30 May 2017. ^ "10 facts about smartphones". Pew Research Center. Retrieved 2018-12-14. ^ "The Daily — Residential Telephone Service Survey, 2013". Statistics Canada. Archived from the original on 2014-10-23.